Options: 16 oz. 32 oz. 8 oz. Keep food and water clean with galvanized metal cups. This provides a healthier environment for rabbits, small animals, and poultry. Built-in hooks clip wherever you want, to any type of wire hutch or coop, indoors or out. 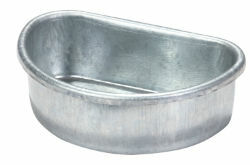 Heavy-duty galvanized steel for years of service, with rolled edges for safety.